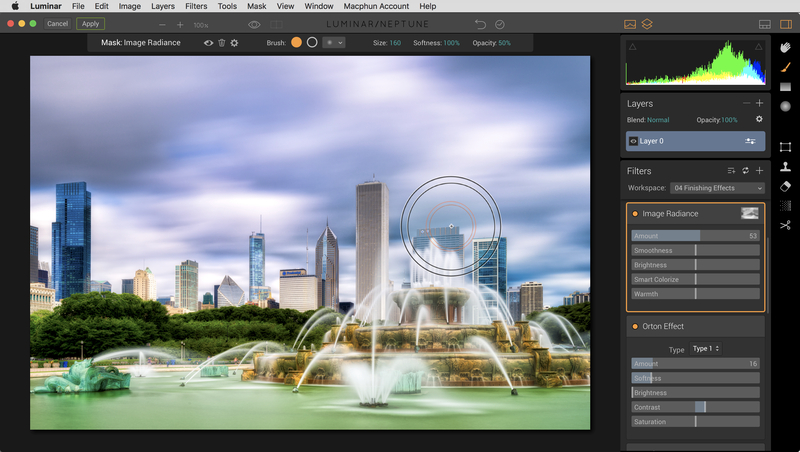 While there are several Macphun software plug-ins available for Mac users (and they are excellent), Luminar is so incredibly flexible that it can take the place of most of the other filters, provided you know where to look. Because Luminar is coming to Windows, too, it’s the one Macphun product I think you should be familiar with. Here are some tips for getting the most out of Luminar. The Luminar interface is quite similar to that of Color Efex Pro. You add effects filters one by one on the right-hand side of the interface. 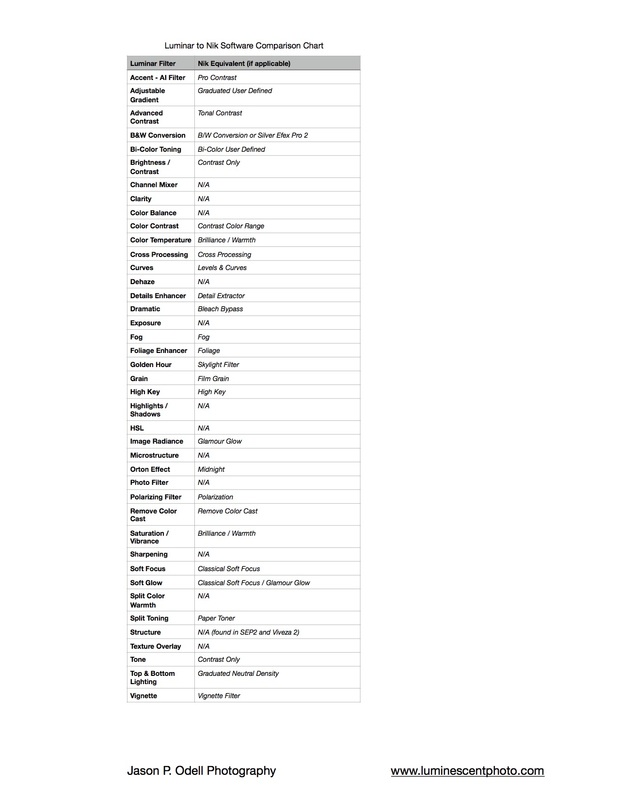 The filter list As with most editors, order of operation is important. 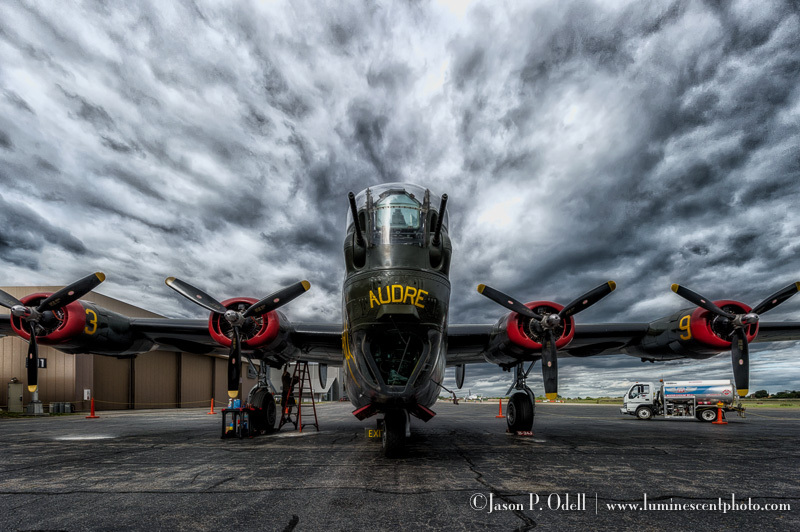 Start with exposure and contrast effects before moving to color adjustments and detail. Apply effects filters (such as vignettes) at the end of your workflow. The Luminar interface includes a filter list (right) and presets (bottom). You can add filters to the active layer by clicking the “Add Filter” button. Once a filter is added, you can adjust its sliders to get the adjustment or effect you want. You can also drag the filter modules around to re-order them. Remember, effects are applied in the order they are added and build upon each other from the top down. 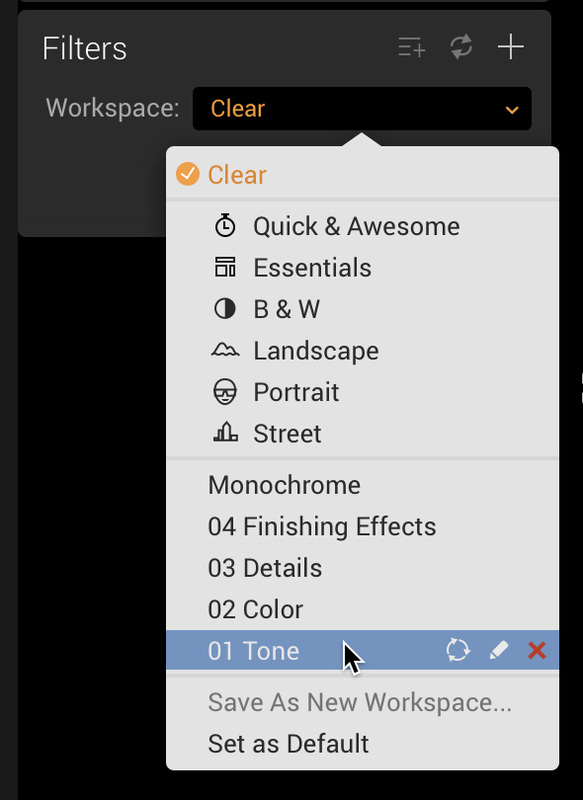 Workspaces allow you to save groups of filters without adjustments. Workspaces are a great feature in Luminar. Unlike Presets, which save filters and their settings, Workspaces save a group of filters with their default (or null) settings. This feature is incredibly useful for photographers who want to work on individual images but have a saved set of adjustment tools to start from each time. I’ve created a set of custom Workspaces for Luminar, which you can download for free. 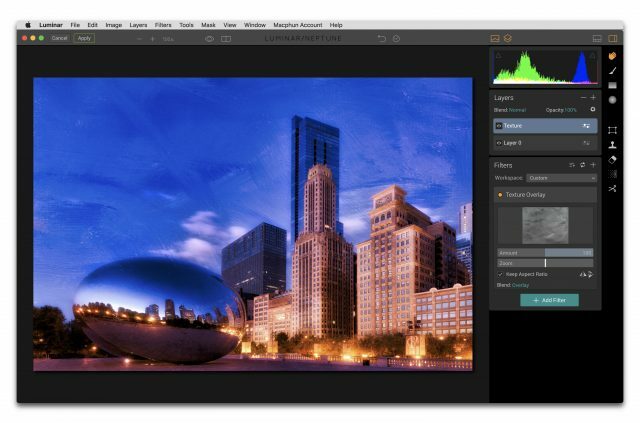 Luminar offers layers, just like Adobe Photoshop. Each layer can hold one or more filters/tools. By adding layers, you can partition your adjustments to make them easier to manage or apply them selectively. 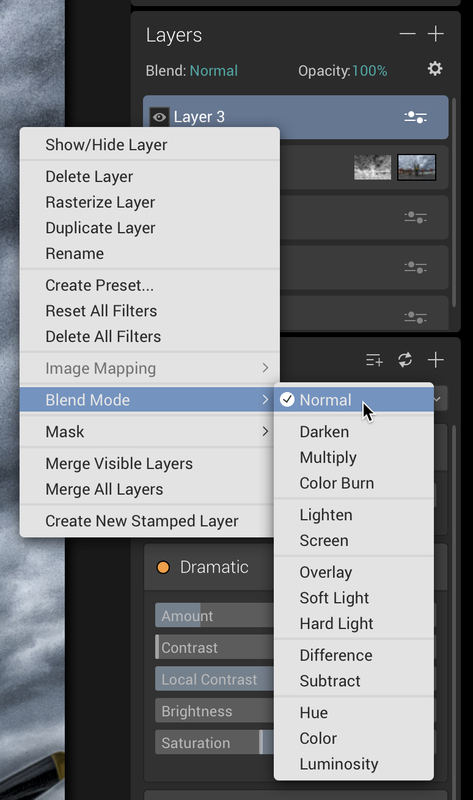 You can also change layer blending modes. Simply right-click on the Layer entry in the Layers panel (top right of the interface) and select the blending mode you’d like to use from the drop-down menu. Luminar offers a couple of important tools for making selective adjustments. Selective adjustments are the key to better images, because they allow you to control where certain effects will be applied. Whether it’s simple dodging and burning or a complex glow or detail enhancing effect, you’ll definitely want to get to know the selective tools in Luminar. Nik fans, I feel your pain, but unfortunately we’re just going to have to get over the loss of Control Points. It’s going to be okay, I promise. Luminosity Masks: Creates a basic (lights) luminosity mask. 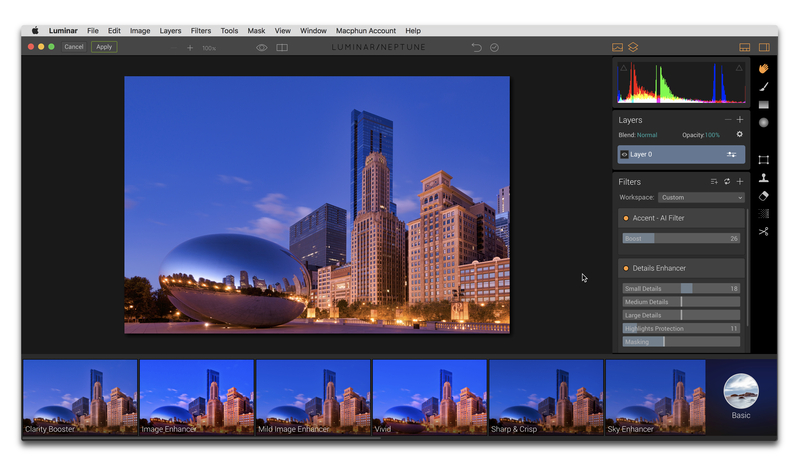 Right-click on a layer or filter name and choose Mask–> Luminosity Mask. You can create a “Darks” mask by using the “Invert Mask” command. When you invoke the brush or gradient tools, the selection mask is applied to the entire layer by default. That means you are painting the aggregate effect of all of the filters in that particular layer. However, you can also apply masks to individual filters/adjustments within a layer. The simplest way to do this is by clicking on either the brush tool or one of the gradient tools. When you do so, you’ll see the active layer become highlighted in the Layers panel. To apply brush/gradient selections to an individual layer, click on the filter effect name while the brush/gradient tool is active. That filter will be outlined in orange, and your brush will only affect it. Use brushes and gradients to selectively apply entire layers or individual filters within a layer. Tone: Allows you to adjust the major tone components in an image, including exposure, contrast, shadows/highlights, and blacks/whites. There’s also a cool “Smart Tone” slider which will brighten or darken your image while preserving highlights and shadows. Saturation/Vibrance: This is the traditional tool for adjusting color in images. Use Vibrance to protect red/skin tones and create deeper blues. HSL: This tool is similar to what you’ll find in Lightroom and allows you to adjust the hue, saturation , and luminance of individual colors. Unlike Lightroom, though, you can use the brush tool to apply this filter selectively. Curves: The standard curves tool for adjusting contrast and color balance. Pro Tip: Set the filter blending mode to Luminosity to adjust contrast without shifting color balance or saturation. Advanced Contrast: This filter can be used to boost, diminish, or enhance contrast in three major tone regions, similar to the Tonal Contrast filter in Nik’s Color Efex Pro 4. Use the Highlights/Midtones/Shadows sliders to darken or brighten the tone region, then fine-tune the effect using the “Balance” sliders. Moving the balance slider to the left darkens a tone region, while moving it to the right brightens that tone region. Unlike Tonal Contrast (Nik), the Advanced Contrast filter does not apply a high-pass (sharpening) effect. Don’t worry, there are other filters in Luminar that do. 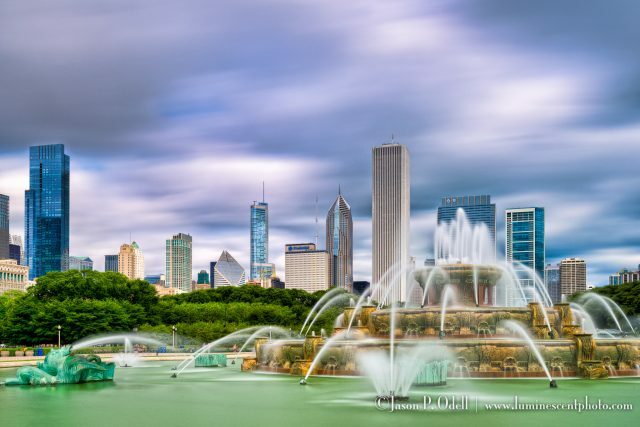 Chicago’s Buckingham Fountain; D810 image processed in Luminar after RAW conversion in Adobe Lightroom. As I mentioned, Luminar can actually be used to replace most of the Nik Collection (the major exception being HDR Efex Pro… check out Aurora HDR for that). While some effects and adjustment tools are obvious (Curves, Saturation), others are not. Here is a list of my go-to Color Efex Pro 4 filters with their Luminar counterparts, which you can download here. B&W Conversion: When you combine the tools in this filter with some of the other filters available in Luminar, you can get a very good replacement for Silver Efex Pro 2. Details Enhancer: Use this filter to accentuate or diminish small, medium and large details. I’ve found it to be a good replacement for Nik’s Detail Extractor when combined with the Advanced Contrast and Structure filters. Structure: The “structure” effect was never available as a stand-alone tool in Color Efex Pro, but it was a part of both Silver Efex Pro 2 and Viveza. I love using this filter with the brush to apply it locally. Use the “Softness” slider to adjust the radius of the effect. Image Radiance / Soft Glow/ Orton Effect: These filters create a nice glow effect similar to “Glamour Glow” in Color Efex Pro 4. Try combining two or more of them for different looks. Launch Luminar from Lightroom: From Adobe Lightroom: You can use the Edit In… command to open any image directly in Luminar. You can choose to edit in JPEG, TIFF, or PSD formats. Smart Filter: In Adobe Photoshop, try using Luminar as a Smart Filter. Create a duplicate image layer and then convert that layer to a Smart Object before running Luminar on it. When you use Luminar as a Smart Filter, you can go back and re-edit your adjustments non-destructively in Luminar. Add Textures: Luminar allows you to add texture overlays to your images from JPEG or TIFF files without using Adobe Photoshop. Select the Need textures? Check out these hand-painted abstract texture images. You can use Luminar’s Texture Overlay filter to add textures to your images. What are your thoughts on Luminar? Leave a comment on my Facebook Page. Disclosure: I was provided with a complimentary license of Luminar for review purposes.